TULSA, OK--(Marketwire - Sep 11, 2012) - Relax and revive with an escape like no other at a sophisticated Tulsa, OK day spa where experienced staff are dedicated to providing guests with an intimate and luxurious spa experience. Located inside a prominent hotel in Tulsa, Oklahoma, the Spa Southern Hills beckons hotel guests and locals alike, pampering them with premium body and facial treatments from a full menu of services designed to meet individual needs. From spa essentials including massages, facials and manicures to indulgent treatments, aromatherapy and even special treatments for couples, the skilled staff of Spa Southern Hills seeks to provide complete comfort and relaxation whether preparing for a special event or simply seeking rejuvenation from the stresses of everyday life. Making its home on the second floor of the Marriott Tulsa Hotel Southern Hills, this spa welcomes travelers and area residents to the hotel's pristine Tulsa, Oklahoma accommodations with grand hospitality and opulent surroundings for an unrivaled spa getaway. Featuring combined Spa Southern Hills and unique Tulsa hotel deals, guests can lavish in full service accommodations while enjoying unique opportunities for events such as a romantic couple's weekend spa escape or fun girls' night out! The facility is also an ideal choice for weekend retreats. However, those traveling to the hotel should note that all spa services require an appointment, even if hotel accommodations are booked, as this popular day spa fills up fast and same-day services are not always available. Appointments may be made by calling the Spa Southern Hills directly at 1-918-493-2646. A great way to design a romantic rendezvous with each other, this package allows couples to unwind together under candle light, far removed from daily hassles so they can focus on each other and their combined well being. This package includes a one-hour full body massage or signature fitness facial as well as services of the spa's rejuvenating Oxygen Bar. Inclusive with an overnight stay in one of the Marriott's deluxe rooms and breakfast the following morning, this package starts at $309*, or couples can take advantage of spa services only for just $195. What fun! Gather the girls (a minimum of five required) and celebrate life with rejuvenating services that will result in an exciting journey of fun and relaxation. The party begins with each person choosing a minimum of $100** in services from the spa's intriguing a la carte menu a week in advance, and then upon arrival everyone will be set to enjoy their own regimen. This private spa extravaganza also treats party members to delicious pasta, salad, fruit and wine for a truly exceptional girls' escape. 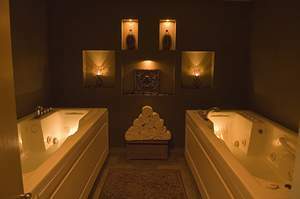 More information about these and other spa packages may be obtained by visiting http://www.spasouthernhills.net and hotel accommodations can easily be booked online at http://www.marriott.com/hotels/travel/tulse-tulsa-marriott-southern-hills/ or by calling 1-918-493-7000. *Rates are per room per night based on availability at the time of reservation. Spa services must be booked separately. Offer does not include groups of 10 or more rooms and may not be combined with any other discount or promotion. Please visit hotel website for additional terms and conditions. **A 20% gratuity will be added to all services. The Marriott Tulsa Hotel Southern Hills is a distinctive luxury hotel welcoming guests with exceptional accommodations and renowned Marriott service. Conveniently located near the River Spirit Casino and other popular Tulsa destinations, the hotel is ideal for both business and leisure travelers, featuring two on-site restaurants, a full service business center, well-equipped health club, 24-hour weight room, heated indoor pool, full-service beauty/barber shop and nearby access to the Rivertrails for biking, running or walking. Relax and revive with an escape like no other at The Spa Southern Hills, a sophisticated Tulsa, OK day spa where experienced staff are dedicated to providing guests with an intimate and luxurious spa experience.